These are lyrics by Nerf Herder that we think are kind of repetitive. 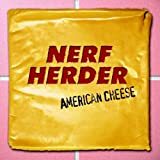 Nerf Herder's, "New Wave Girl"
"New Wave Girl" is repeated 40 times in this song if I counted right. The song uses the word "sorry" 22 times if I counted correctly.